Gavin Kaysen Leaving Daniel Boulud’s Restaurant GroupThe acclaimed young chef is headed to Minneapolis. Thomas Keller Would Like You to Say Hello to Team USAThe culinary competitors are coming to the Big Apple. Grub Street Plays Cupid With Tartufo Bianco and Gavin KaysenHooking up the well-shaven. Kaysen, Keane, and Cimarusti Cooking with William Bradley To Benefit BocuseGet ready for the Michelin stars to collide over six courses at Addison. Gavin Kaysen Bringing Cafe Boulud to Animal For One NightThe only way we can imagine the restaurant becoming even more in demand. Gavin Kaysen, Sandwich ArtistThe Cafe Boulud chef was discovered at a Subway. Pigging OutWho won this weekend’s Cochon 555 heritage-pig competition? Interview: Top Chef Winner Michael Voltaggio Reveals His Regrets andMichael Voltaggio tells us what it’s like to be the new Top Chef. Bocuse d’Or Draws Few ApplicantsThe time and expense required to prepare deters many chefs from the lauded contest. More Chef Love for Franny’sA panel of distinguished chefs talks trends. David Chang Continues to Win Awards You Never Knew ExistedBoth Bravo and USA are getting in on the Changbang. PepsiCo Suffers When You Drink Tap Water; Pastas for High-Pressure TimesShopping for groceries with studly chef Gavin Kaysen in his neighborhood, and the future plans for Aureole, from our glance at the morning headlines. Terrifying Panel of Bocuse d’Or Judges AnnouncedFormidable chefs from around the country. Harvard Grad Couldn’t Find His Way Out of a Bar With a Key; FirstWhat Bruni thinks of the Beard results and why you might consider spending $12 for a forty, in today’s neighborhood food news. Clinton and Ray Team Up for Fund-raiser; What Lidia Served the PopeThe former president and America’s first lady of home cooking are putting on a fund-raiser together, Pinkberry isn’t as “all natural” as you’d like it to be, and a recipe for a season-appropriate dish served to Pope Benedict XVI last week. 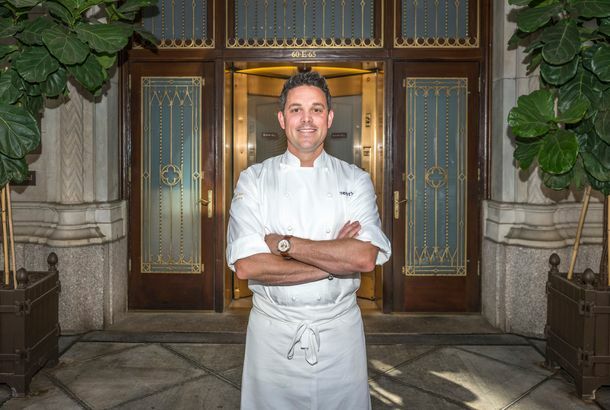 Jim Leiken Is the Next Star From Boulud’s Chef StableDB Bistro Moderne’s Jim Leiken is poised to get a DB restaurant all his own. New York Looking Good for Beard Awards 2008Who’s the best chef in New York?